At one time, Big Spring supported a large distillery, owned by Jim Wheatley. It was located behind and to the right of the Clarkson-Hardaway mansion. The whiskey made at the distillery was known as "Big Spring Straight". Since it was not sold in bottles, customers had to fill their own containers from spigots that were in the end of each barrel. There were several fine houses in the town. One of the most elaborate was known as "Maplewood, " the Clarkson-Hardaway home. Today, this house is even more beautiful than ever. The home, at one time, was surrounded by large, maple shade trees,. During the home's course of time, it has housed many elegant furnishings (there will be more about this home in a later issue of this paper). Big Spring was hit by two outbreaks of typhoid fever. The first was in December 1883 through January 1884. Nine people died before the cause of the disease was found. It was discovered that the town well, which was only used when the spring got muddy, was contaminated with typhoid germs. Carl Martin, an 85-year-old resident of Irvington and former Big Spring resident, said he remembered the other outbreak of typhoid. "People got sick and some died. NO one knew what was causing the sickness. Finally , the town well was tested, and once again, authorities found typhoid germs in the water. The well was never used again," he said. Big Spring has several claims to fame. The chief claim is that it is the birthplace and/or home of several great men. Among them were Proctor Knott, who became governor of Kentucky; Charles Harwood Moorman, a judge of the United States Circuit Court of Appeals; And Dr. Milton Board, chairman of the Kentucky State Board of Health. Another claim to fame evolved around the production of hog feed. In 1885, on his farm near Big Spring, Tom Moorman was concerned about the poor condition of his hogs. He wrote the United States Department of Agriculture in Washington D.C., and received a formula for a remedy or "hog tonic." Mixing it painstakingly, according to directions, he fed it to his hogs - and it helped them! Soon neighbors wanted to buy some of the product. Then and there the Moorman family established a small business in their barn - mixing, packaging, and then delivering the product with a spring wagon. It was in 1900 that two of the Moorman sons, E.V. and C.A., saw the possibilities of the product in the hog country of the Midwest and moved to Gorin, Mo, and later, to Quincy, Ill., where they established the Moorman's Company. The small business that was founded near Big Spring, has now developed into a billion dollar industry that employs some 4,000 people. Some of the best educators in the state taught school at Big Spring. In the early 1900s the school was the center of activity. The building was used for church services and all community events, including plays and Christmas activities. Beginning in the 1920s, enrollment at the Hall School near Big Spring began to decline. Fifteen students were enrolled in 1920, and by 1936, the number had dwindled to four and the school closed. 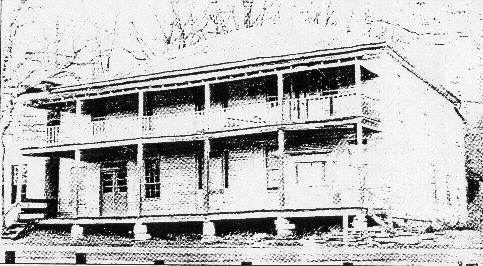 The Sphires School at Big Spring was discontinued in 1951. Today students attend Irvington and Custer elementary schools. High school students attend the school of their choice in one of the three counties. Compared to the earlier days, the Big Spring of today is virtually a ghost town. There are still three churches, a post office is located in the only grocery store, and Mr. and Mrs. Dan Hardaway own and operate Hardaway Elevators, Inc. one-fourth mile north of the town. The Big Spring post office was established in 1826. This post office merged with Plains in 1894 and High Plains in 1927. Mrs. Glenda Miller, owner of the store said, "The three churches work together to help needy residents in and around the community." "It's really wonderful when you see all three churches come together, not only for their own members, but for those who don't belong to the churches," she said. "I don't think you'll find a town better than Big Spring when it comes to helping each other." Big Spring - a link with the past, was settled long before many of the other towns of the area. It grew fast for a period of time, then slowed, and stopped. To keep the town alive, each year Big Spring holds "Down Home Days," the first Saturday and Sunday in June. This event brings former residents together with friends and relatives for a visit and a chance to reminisce. This 15-year-old event has never been rained out and it draws an overflow crowd. Information for this article was obtained from the following sources: interviews with Big Spring residents; The News-Enterprise: September 20, 1979, and December 14, 1987, story by Peggy Riley; The Breckinridge County Herald News: April 15, 1965, and August 31, 1978, story by Linda Matthews; Kentucky Place Names by Robert Rennick; Moorman's booklet, About Our Company, Two Centuries in Elizabethtown and Hardin County by D.E. McClure Jr.; Brave New Beginnings by the late Burnett Powell; Breckinridge County Board of Education minutes; and The Herald News microfilm. Next week: Watch for Big Spring news stories that made the headlines from June 25, 1879 through January 9, 1884 in Cloverport's Breckinridge News.